This page features four adjacent sites that are really part of a whole: the underground factory for the manufacture of V-1 and V-2 rockets at the southern border of the Harz mountains near Nordhausen and the adjacent concentration camp where the forced slave laborers who built the rockets were housed -- the Mittelwerk rocket factory and the Dora-Mittelbau camp -- and two nearby associated underground factory sites, the B3a and B12 tunnel complexes. 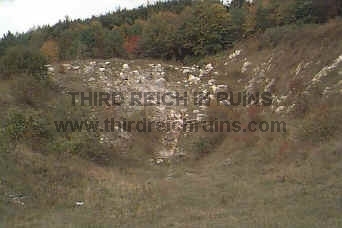 The Kohnstein hill near Nordhausen had been mined for gypsum since 1917. This mining left a series of tunnels, and these were planned for underground storage of strategic petroleum reserves in 1934. 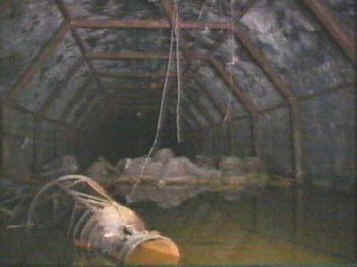 Two parallel tunnels were to be dug through the mountain from north to south. 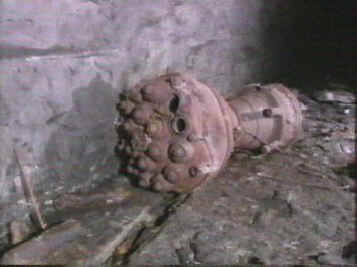 These were to be connected by a ladder-like series of lateral chambers (galleries) running between the main tunnels, and a smaller service tunnel running through the middle (parallel to the main tunnels). 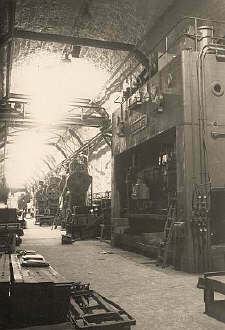 Narrow-gauge railways were run into the main tunnels to connect with the main rail system. 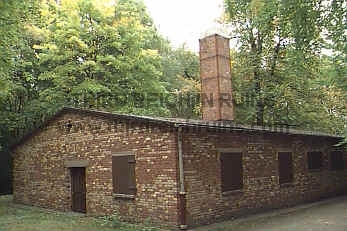 In the middle of 1943, this complex was the largest storage area for fuel and oil in all of Germany. 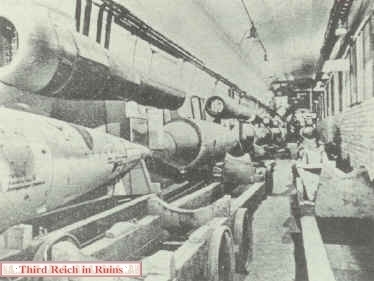 But Hitler's pet project of his secret "Revenge Weapons" - the V-1 and V-2 rockets - had a higher priority. 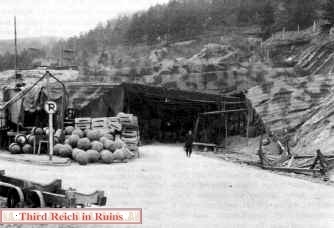 The V-2 development complex at Peenemünde on the Baltic coast was bombed in August 1943 and early 1944, so production was moved to the tunnels in the Kohnstein hill. 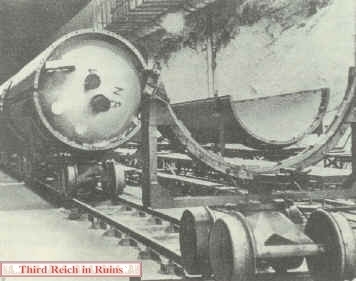 A company called the "Mittelwerk" took over the work, and rushed the tunnel system to completion. Eventually, there were some 47 cross-chambers, although not all actually connected Tunnel A with Tunnel B. 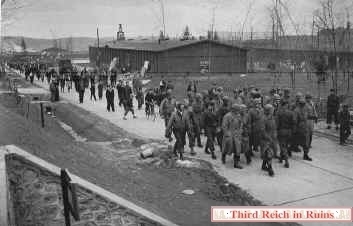 Work on the tunnels and assembly of the rockets was performed by slave laborers from Buchenwald concentration camp. 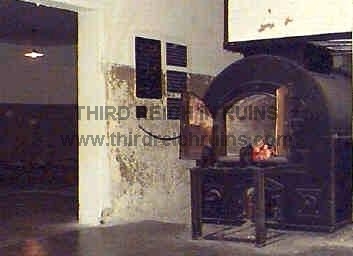 At first these inmates lived in miserable conditions in the tunnels themselves, subject to the damp, darkness, dust, and constant noise of the underground site. 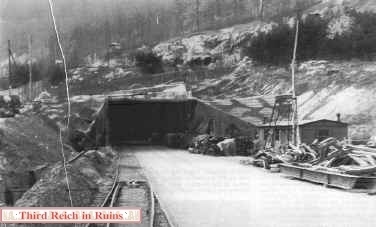 Later a camp was built adjacent to the tunnel entrances on the southern side of the Kohnstein; this was code-named "Dora" (also called "Mittelbau"). 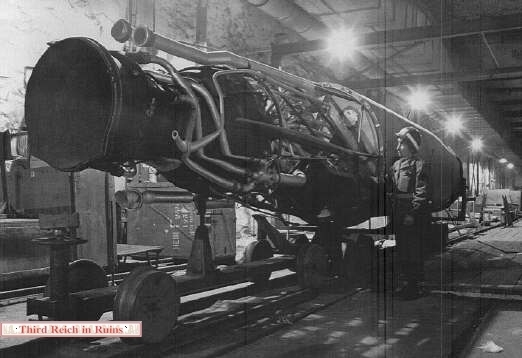 Dora eventually became one of the largest labor camps in Germany, and the Mittelwerk eventually produced V-2 rockets, V-1 "flying bombs," and jet engines for Me 262 and Ar 234 aircraft. In 1945, production of the "Taifun" and "Orkan" anti-aircraft missiles was added to the slate. 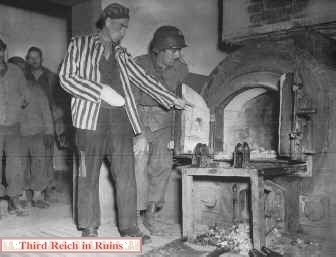 By 11 April 1945, when the U.S. Army 3rd Armored Division overran the complex, the Mittelwerk factory had produced over 13,000 V-1 and V-2 rockets, at the expense of the lives of some 20,000 of the forced laborers. The Americans, and later the British, removed as many completed rockets and parts as they could (this led to the birth of the United States space program), and the Soviets took over the site in July 1945. 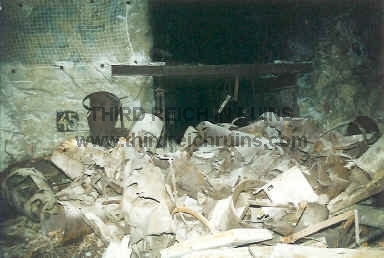 After taking what they wanted, the Russians attempted to blow up the interior tunnels. 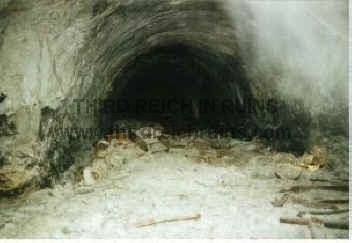 Finding this impossible, in 1948 they sealed all the exterior tunnel entrances by explosion. After German reunification in 1989, explorers found that the Soviets had left behind an amazing array of V-1 and V-2 parts, some of which have been placed on display in various museums. 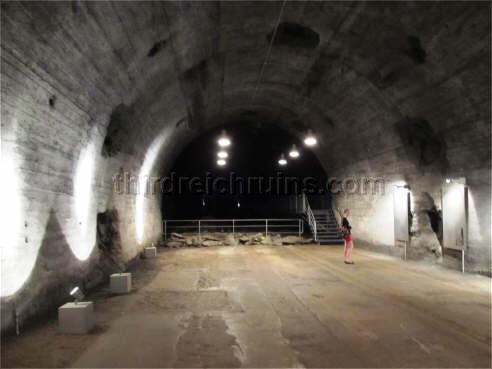 In 1995 a new tunnel was dug from near the Tunnel B entrance into Tunnel A, just past the exploded entrance, and guided tours of Tunnel A up to Gallery 44 are available through the Gedenkstätte Mittelbau-Dora museum. Click here for a MapQuest Map link to this location. 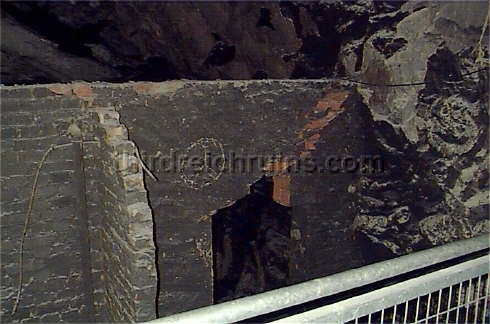 The tunnel entrances on the south side appear like this today. 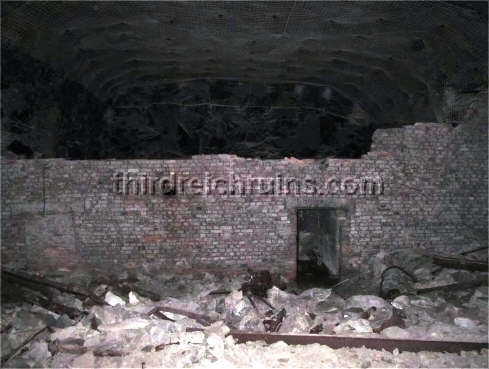 The Soviets blew these entrances up in 1948, and several yards of the tunnels were collapsed. This is the site of the Tunnel A entrance. 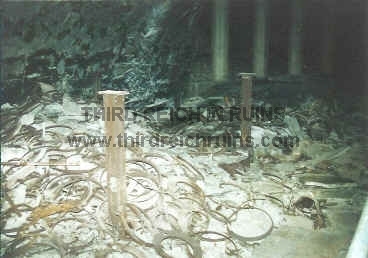 When the tunnels were reopened in the early 1990s, various V-1 and V-2 parts that the Soviets had left behind were found. 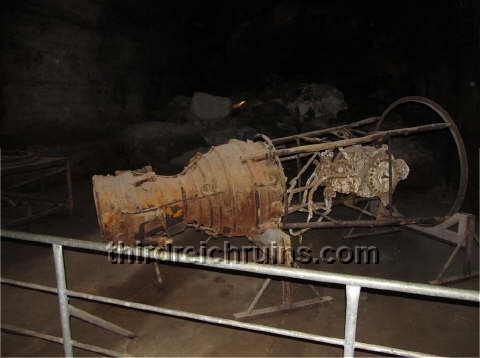 Some were recovered for display - this V-2 engine assembly is at the present entrance to Tunnel A. 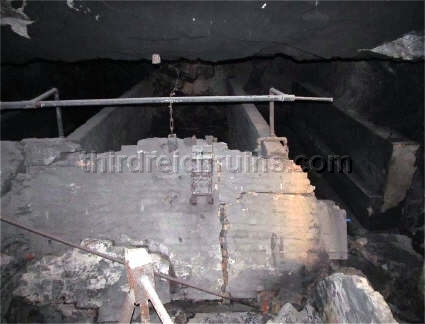 The beginning stretch of Tunnel A on the south side has been reopened, and can be visited as part of a guided tour. 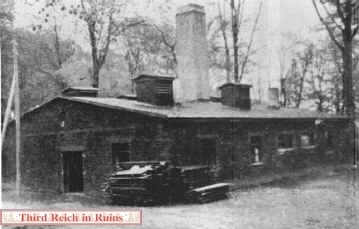 Crude rooms for equipment storage and living spaces for the laborers, as well as primitive latrines (below) were made in side chambers in Tunnel A. Slave laborers lived in these extremely trying conditions until barracks were erected in the camp outside the tunnels. Gallery 46 was the first side passage on the south end of Tunnel A, but it did not go all the way through to Tunnel B. This chamber was used as living quarters for the prisoner laborers and later for V-1 construction. 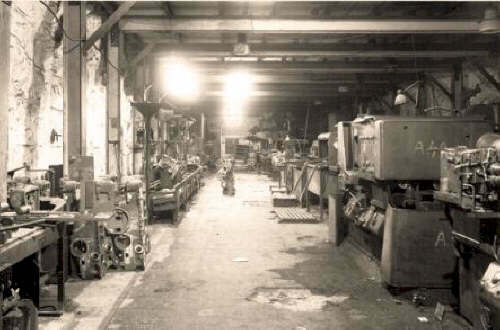 Click here to visit a webpage with an extremely interesting collection of 1945 photos taken inside the Mittelwerk. Same view today. 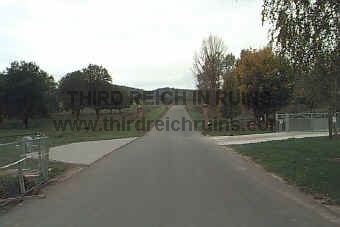 The posts on either side of the road, just beyond the drive to the right, can be seen near the center of the period photo. The drive leading off to the right goes to the entrance to Tunnel B. 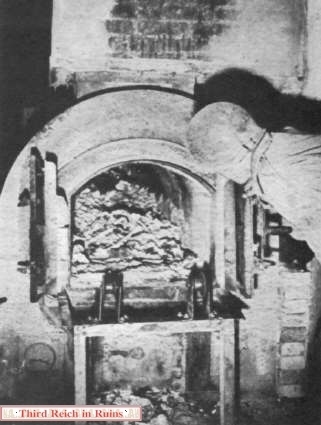 A GI inspects remains found in the crematorium oven in April 1945. 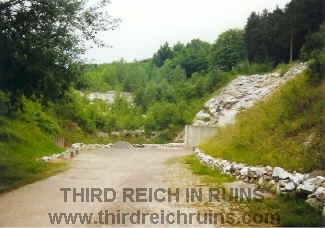 Click here to visit the Third Reich in Ruins page on other underground sites in Thüringen. 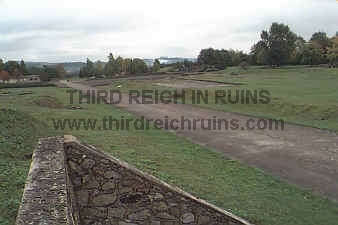 Follow these links to visit other Third Reich in Ruins pages on concentration camp sites -- Dachau, Buchenwald, Sachsenhausen, Flossenbürg, S/III Jonastal, Mauthausen (includes Gusen), Ebensee (Austria). The best published guide to the site in English is Karel Margry's article "Nordhausen," in After the Battle magazine No. 101 (1998), pp. 1-43. A truly amazing book is Alvin Gilens' photo work Discovery and Despair (Westkreuz-Verlag, Bad Münstereifel, 1995), which shows many photos of the tunnels and galleries that are not accessible to the public. 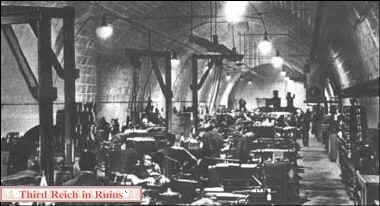 For those who can find it, the best source of detailed information on the Mittelwerk and all the associated underground factory sites is "Underground Factories in Central Germany," report of the Combined Intelligence Objectives Sub-Committee (CIOS), London, 1945 (Item Nos. 4, 5, 25 & 30, File No. XXXII-17; copies in the National Archives, Washington, and the Imperial War Museum, London).